First Solar Inc. (NASDAQ: FSLR), Pattern Energy Group Inc. (NASDAQ: PEGI), and Brookfield Renewable Partners LP (NYSE: BEP) have each been dealing with the headwinds of a difficult renewable power market. But there are solid signs that the three stocks are positioned to benefit in the future. If you can handle a little near-term uncertainty, these three Motley Fool contributors think you should get to know these renewable power stocks today. 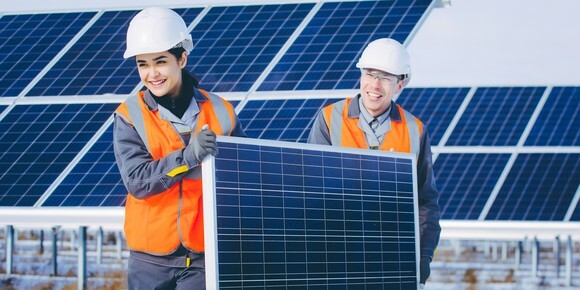 John Bromels (First Solar Inc.) Even if you'd given up on solar stocks after their dismal performance in 2017, you should keep an eye on domestic solar panel manufacturer First Solar in October for three big reasons. First, in September, California governor Jerry Brown signed a bill into law that requires 100% of California's electricity to be generated from "zero-carbon" sources like solar or wind by 2045. That's ambitious, but a less-heralded aspect of the bill moved up the timeline for California to achieve 50% of its electricity generation from zero-carbon sources from 2030 to 2025, just seven years from now. That should spur development of large-scale solar installations of the type that First Solar provides. Second, the current tariffs of up to 30% against imported solar panels don't seem to be going away anytime soon, making domestic manufacturers like First Solar more attractive to customers. And, of course, state governments often prefer to support domestic manufacturing when spending on large infrastructure projects, rather than risk being accused of supporting foreign competition. The third reason is that the company reports earnings on Oct. 25. Its first two earnings reports of the year were wildly divergent, with a fantastic Q1 giving way to a dismal Q2 report that included lowered guidance for the year. Investors have bid down the share price more than 30% so far this year, which may mean the stock is in value territory. 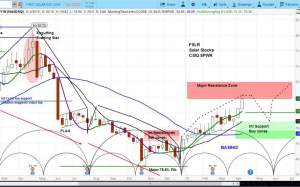 It's a risk, for sure, and you may want to wait and see what the Q3 earnings report brings, but either way, First Solar is a top renewable stock to watch right now. Matt DiLallo (Pattern Energy Group Inc.): Wind and solar power company Pattern Energy Group had been an excellent dividend growth stock over the past few years. Since it started paying dividends in 2014, the company increased its payout in each of the next 15 quarters, boosting it 35% overall. However, the company's dividend growth engine stalled out at the end of last year. Instead of continuing to give its investors raises, Pattern Energy has held its dividend flat for the past few quarters so that it can improve its financial profile. The company aims to get its dividend payout ratio to around 80% of cash flow, which is a much more sustainable level than its current rate of more than 90%. That approach will enable the company to internally finance a larger portion of future growth as opposed to relying on the capital markets, which was getting too expensive after its shares lost 25% of their value in the last year. Pattern Energy needs that financial flexibility so that it can continue making acquisitions since it has a large enough opportunity set to grow cash flow at a double-digit annual pace. While Pattern Energy has enticing growth prospects and currently offers a monster 9.3%-yielding dividend, it's unclear when the company will start increasing its payout. That's worth noting since dividend growth stocks have historically outperformed their stingier peers. Because of that, I think investors should keep this renewable energy stock on their watchlist until it restarts its dividend growth engine. Reuben Gregg Brewer (Brookfield Renewable Partners LP): Brookfield Renewable's business is built on a fluid foundation, specifically a globally diversified portfolio of hydroelectric plants. Those assets, which require minimal upkeep, account for roughly 80% of funds from operations and underpin the partnership's expansion into wind and solar. However, that's only half the story here. 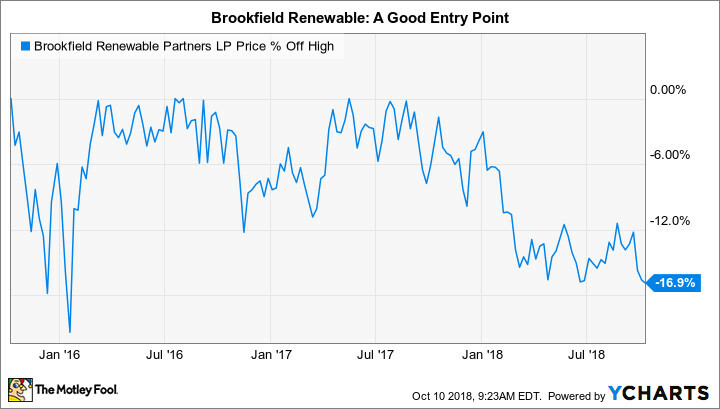 Brookfield Renewable Partners is one of many entities controlled by Brookfield Asset Management, an over-100-year-old Canadian company that specializes in hard assets. It actively manages all of the partnerships it controls, buying and selling assets over time. For example, Brookfield Renewable recently disposed of solar and wind assets in South Africa, freeing up cash to invest in markets that it believes are more promising. That said, the partnership is still largely building its portfolio, a move opportunistically bolstered by the acquisition of TerraForm Global in 2017 and a controlling stake in TerraForm Power in 2017 that was expanded in 2018 (adding 3.2 gigawatts of renewable power assets spread across 10 countries). In addition, Brookfield Renewable has around 1,000 megawatts of power projects in the pipeline. So far, the results have been pretty good, with funds from operations growing at roughly 7% a year, on an annualized basis, since 2012. The distribution has been increased each year for nine consecutive years. The basic business model, meanwhile, is essentially the same one that the general partner has executed to great success at Brookfield Infrastructure Partners LP. Brookfield Renewable's stock is down around 17% from highs reached in mid-2017, pushing the yield up to 6.5%. Now is a good time for long-term-income investors to look at this growing renewable business that is following a tested and successful business plan. David and Tom just revealed what they believe are the 10 best stocks for investors to buy right now... and First Solar wasn't one of them! That's right -- they think these 10 stocks are even better buys. 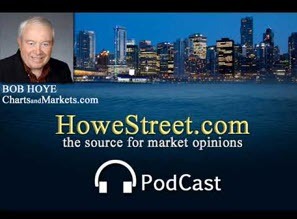 John Bromels has no position in any of the stocks mentioned. Matthew DiLallo owns shares of Brookfield Asset Management, Brookfield Infrastructure Partners, Brookfield Renewable Energy Partners, First Solar, and TerraForm Power. Reuben Gregg Brewer has no position in any of the stocks mentioned. 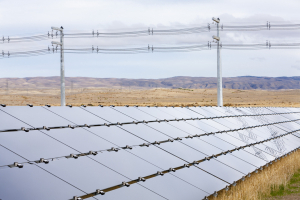 The Motley Fool recommends Brookfield Infrastructure Partners and First Solar. The Motley Fool has a disclosure policy. 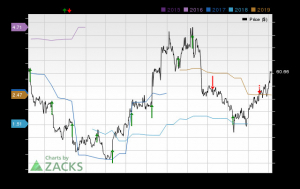 First Solar (FSLR) Expected to Beat Earnings Estimates: Can the Stock Move Higher? Are we near a peak clean energy moment?